november 1st - a day perfect for tucking away the skeletons, pumpkins and bats that have filled the corners of our homes, and turn our attention to the most wonderful time of the year! over the next several weeks, i will be sharing a few of my favourite recipes in a series called '12 days of baking', delicious and nostalgic treats you can make in advance, pile up in your freezer, and pull out whenever friends pop by. i have recruited a few of my wonderful friends to help along the way, sharing some of their favourite family recipes. in the end, we will have a collection of 12 of the absolute best recipes around. full of love, happy memories, and family traditions. When I was little, my grandmother had a list of recipes that were reserved specifically for Christmastime. There were the usual holiday staples that made an annual appearance – shortbread, almond roca, popcorn balls, but the undisputed scene-stealer in our family was, without a doubt, her butter caramels. I remember anticipating that first taste months before the snow started to fall. And finally, when that Sunday dinner came around and my Grandma placed her Tupperware containers of baking on the counter, I remember filling my pockets with more than my stomach could possible handle. Unwrapping and shoving 3 or 4 in my mouth at a time, knowing that after that night, it could well be another 12 months before I got my beloved caramel fix again. 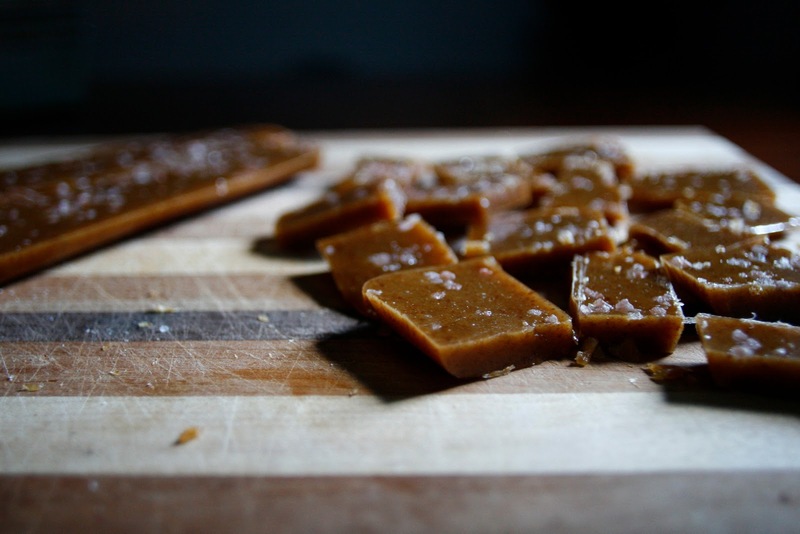 A few years ago, my Grandma happily shared her caramel recipe with me. It’s a simple mixture of a few basic ingredients, but boiled patiently to the perfect temperature, they become the sweet treat of my fondest childhood memories. I have adapted her recipe ever so slightly- using honey instead of corn syrup and adding coarse sea salt to compliment the sweetness in the most perfect of ways. The sea salt is of course optional and with or without, you will be left with a delicious treat. 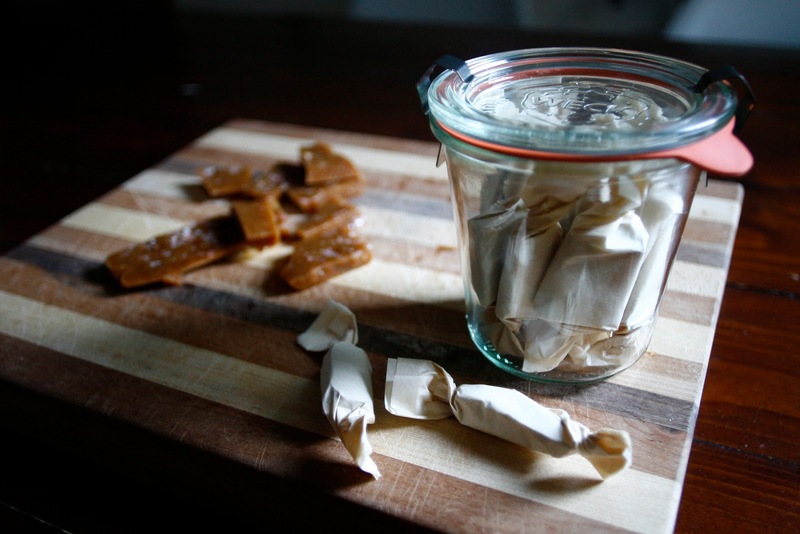 Note: It is definitely best to use a candy thermometer when making these caramels. There are ways around it if you don’t have one (see instructions here), but the results wont be as consistent, and if baking or candy making are something you enjoy, it’s definitely worth the $10 investment. Prep two small bread loaf pans by lining with parchment paper. * If you don’t have loaf pans, you can use something similar in size – a square casserole dish or cake pan should do the trick. In a heavy pot, mix together about half the sugar and two tbsp of water over medium high heat, stir mixture constantly until well dissolved and the mixture starts to turn a beautiful amber/golden colour- approximately 4-7 minutes. Remove the pot from heat and add the remaining sugar, milk, honey, and butter. At this point, it will likely solidify and look like you did something wrong but don’t fret! That’s totally normal! Once it heats up again it will all start to melt back together. Return to heat, add your candy thermometer and continue stirring pretty much constantly until it reaches just a little harder than the ‘soft ball’ reading on your thermometer (around 240 degrees). Once cooled, remove from pan onto a cutting board. With a large, sharp knife, cut down the middle lengthwise, and then into small bite sized pieces, about ½- ¾ “ think. 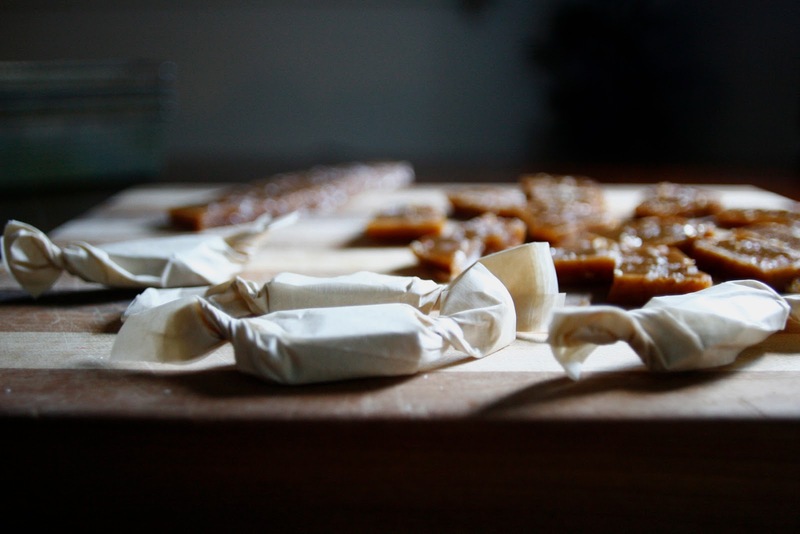 Cut parchment paper into squares, and individually wrap caramels.